Tokyo Punch was a lovely surprise for this cosmopolitan lover. 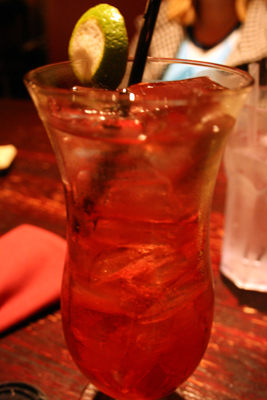 Most people might assume that a cocktail made with vodka, cranberry, Midori, and brandy would be awfully similar to a cocktail made with vodka, cranberry, lime, and triple sec, but I somehow missed the connection between the two until the libation met my tongue. So how was it? Pretty darn good! It’s an attractive drink that’s strong on the cranberry, which is needed when brandy is one of your mixers. The Midori had a mellowing effect on the brandy’s profile, also. Somehow, it all tasted like a cherry jolly rancher to me, though there was no cherry in the mix. There was also a candy film to it, which sounds gross but wasn’t at all. It was more akin to a clear candy, like a lollipop with no flavoring. I attribute that to the vodka acting as more of a lubricant than an essential part of the mixture. I’d drink another, though I’d prefer it in martini form rather than overloaded with ice in a hurricane glass. But, well, I prefer most my drinks that way, so I’m biased.